I can never begin describing the layers upon layers of Orthodox Tradition when I am writing or speaking with others. This is true, at the very least, because the Tradition is itself also the “life” of the Church (in Orthodox understanding). A life – particularly a life that is Divine, cannot be described. It can only be experienced. Description, at best, only offers a small glimpse. One of the elements of Orthodox life that is lost to those outside is the rich role of music in the Church. Many who come to Orthodoxy in the West are hesitant when the find the various musical presentations of Orthodoxy to be so, well, foreign. As my years in faith add up, however, music begins to take on new meanings. I feel as though I’ve largely forgotten the hymns of my former Church – regardless of their beauty. In Orthodox practice music, the various melodies employed, etc., have their own associations, even multiple associations, which like icons and other elements of the services, bring various theological events, insights and moments into one another’s presence and thus produce a commentary. This is particularly rich during Holy Week and Pascha (though in American practice there remain many musical melodies known only by name and not by sound – the Tradition is only slowly being set in place). It is thus hard to describe what is happening when these various layers of the Tradition – liturgical, ritual, musical, textual, iconographic, etc. – all begin to work together in the course of the Church year. The experience of the Church’s life reveals a texture that can be found in few if any other settings (I cannot think of any). I am particularly struck by the fact that what I know of this element of the Orthodox life is, in fact, at a rather minimal level. I have had conversations with those for whom these many layers are known as familiar territory. I can think especially of some conversations I have had, or been present at, with Fr. Paul Lazor, retired from the faculty of St. Vladimir’s Seminary. His conversations alone carry a wealth of Tradition. Western bell-ringing is famous either for playing music (as is done with Carillons) or in playing mathematical schemes (as in change-ringing). Russian bell-ringing has its own rules with various patterns being required at various occasions. But beneath all of its patterns is the icon of the voice of God. The complexity that these many things bring to Church life is, like the voice of the bell, an icon of the life of God as well as the mystery of our participation in His life. 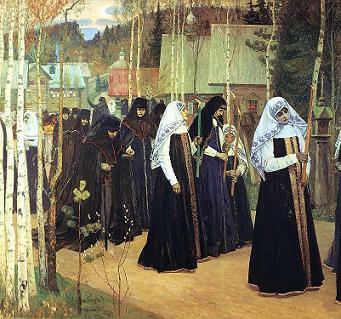 Conversations I had ten years ago about music in the Orthodox Church (“Would there ever be a place for Western hymns in Orthodoxy?”) now seem trite – devoid of understanding the life into which I was entering. I am a neophyte, only now awakening to the Life that has been given me. But knowing something, anything, of that Life is an invitation to follow the voice of God. The source of the quote on the bells comes from a marvelous Orthodox blog by Fr. Milovan Katanic, a Serbian Orthodox priest, whose comments have graced articles here at Glory to God for All Things. I have added his website, Again and Again, to the blogroll, its absence being an oversight on my part for which I can only beg forgiveness. It is always a very good read. My title is slightly misleading. 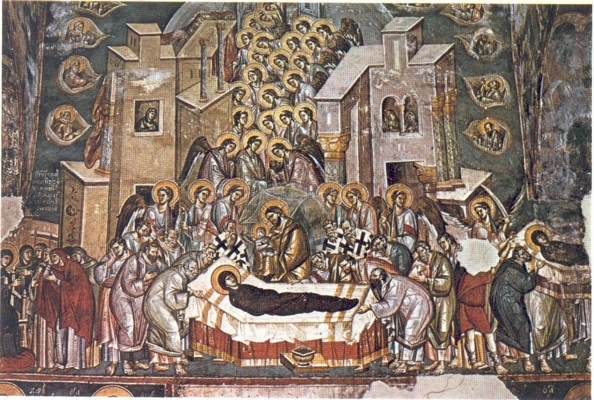 There are not “forty days of Christmas” in the Orthodox Church – but there is a major feast that marks the fortieth after Christmas: the Presentation of Christ in the Temple, sometimes called the Feast of the Meeting (February 2). It occurs forty days after Christmas in accordance to the requirements of the Jewish Law. Tradition holds that Joseph and Mary brought the child to Jerusalem before departing for Egypt. There are two significant “meetings” that occur in that feast: the encounter with the Elder Simeon who has long awaited the Messiah and had been promised of the Lord that He would see Him before his death. He takes the child in his arms, gives thanks, and offers words of prophecy. The other is with the Prophetess Anna, who offers words to those around her concerning the Messiah. Cried the old man to the mother of God. What marvelous imagery! To see the coal of fire touched to the lips of Isaiah and see in it a type of Christ Who is a burning fire! To see the hands that held him as like the tongs by which the Seraphim held the coal to Isaiah! It is a reminder that we are no longer dealing with heavenly visions of a prophet, but with the Reality itself. Indeed, it is a burning fire that was born of the Virgin, and the Elder takes Him into his hands – such boldness to reach out to the incarnate Son of God! This same imagery is evoked in the pre-communion prayers when we remind ourselves that we receive into our mouths the burning coal of Christ, for purification, healing, and life everlasting! Would that we always approached our Lord and our God in such a manner! Christmas goes on, bestowing its blessings on all the world around it, until it reaches the cross and the tomb. The the Divine Fire will light Hell itself. Those who sit in darkness will indeed see a great light – the Star of Bethlehem – the uncreated Light of God! What is the meaning of Scripture? Where do we look for it and how is it found? It is interesting to listen to the disarray of voices on this subject. My early training, in college and later in a liberal protestant seminary, was to look, first, to “authorial intent” (to use a constitutional interpretive phrase), and to the “Sitz im Leben” (the “life situation” or “context”) and through a host of various critical matrixes to break a section down in various ways. Often unacknowledged was the range of meaning that was simply “not allowed.” Most miracles, etc., were simply out of bounds, as miracles. Of great importance was the fact that the Scriptures consisted of a collection of books, written at different times in different places by different authors. And, of course, with a basic historical orientation to the “meaning” of Scripture, the “meaning” sort of falls apart. This, perhaps, enables us to bring into sharper focus…the point, referred to earlier, that the spiritual meaning of the New Testament is the literal meaning…. The spiritual meaning of the New Testament is the history of the Incarnate One, a history which is ‘a new and living way, which he hath consecrated for us, through the veil, that is to say, his flesh’ (Heb. 10:20) – a way which we are all to enter upon and tread. The difficulty with the modernist approach (and many of the historicized approaches of evangelical protestantism) is the failure to understand what the Canon of Scripture means. The Canon is not simply a collection of books authorized for use in the Church. The Canon is not simply those books which the Church considered “inspired of God” (though both statements are true). Instead, the Canon is a collection of books in which the Church finds the witness of Jesus Christ (both Old and New Testament), and its only purpose as Canon, is to reveal Christ. Some, even conservative readers, have detached the proper meaning of the Canon from the Scriptures, and simply see them as a collection of “inspired” Scripture. The key (Christ) is forgotten and the “authoritative” writings are used for all sorts of things for which the Church never had any particular concern. The Bible is not the book with all the answers to any question – it is the book, which when read rightly – points both to the right questions to ask, as well as the right answer. Genesis, properly read, is not a science text book. It is about Christ and reveals Him as the very meaning and purpose of creation – as well as explicating His Pascha. 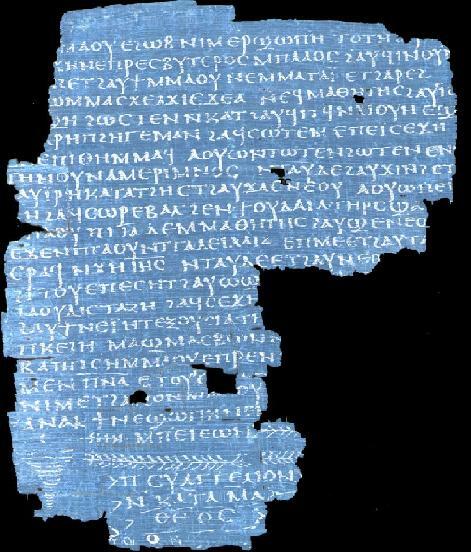 If you don’t see that when you read the first chapter of Genesis, then no one ever taught you how to read Scripture as the primitive Church read Scripture (which according to the New Testament was taught by the Risen Lord). The quote from Louth was not to say that the “literal meaning is the spiritual meaning” but that the “spiritual meaning is the literal meaning.” Only when the Scriptures are read in their spiritual meaning – that which is witnessed to by the Church – are they read in their proper meaning and as Canon. Those who misuse the Canon as simply a stamp of “authority,” turn the Bible into a Christianized Koran, which is as serious a distortion as is possible. The failure of many generations of Christian teachers to know and understand the spiritual meaning of Scripture has also resulted in a distorted Christianity – one which is moving further away from Christian Orthodoxy and gradually becoming something entirely new. To say that the “spiritual meaning is the literal meaning” (a play on words) is to understand that Scripture functions as a verbal icon – and like an icon requires an understanding of its spiritual grammar to see it correctly. Probably the most important element of that grammar is the dynamic of Holy Week and Pascha, the suffering, death and resurrection of Christ. Of equal importance and informing the Paschal meaning is Christ as the revelation of God and the revelation of God as Trinity made known to us through Christ. Even the structure of the stories in the New Testament have this character about them. There are “iconic” similarities between the New Testament account of Christ’s Nativity and his Decent into Hades, just as there are similarities between the icons of those two events. And this is not accidental – one informs and explicates the other. The use of Scripture in the liturgical life of the Orthodox Church frequently brings these elements together. It is in such moments (for me) that “mental epiphanies” occur – when I suddenly see a connection and a meaning that had never been clear before. Those who “Canonized” the Scripture are also those who gave us the liturgies and preserved in the life of the Church a living liturgical dynamic that is the spiritual meaning of Scripture. Much of this is missed if the only liturgical experience of an Orthodox Christian is the Sunday liturgy. Ultimately the fullness is found in the liturgical experience of the monasteries where the most complete round of the services are prayed. But by faithfully attending feast days and vigils, much of this “spiritual meaning” will become increasingly evident. Good teaching also helps. But nothing substitutes for those moments in which the risen Christ is made known to us in the Scriptures and in the breaking of the bread.